CardDav is an open standard for syncing contacts and it's closely related to CalDAV, a standard for synchronizing calendars. Google Calendar already supports CalDAV and now it's time for Google Contacts to add support for CardDAV. If you have an iPhone, iPod Touch or iPad and you want to sync your data with a Google Account, you probably select "Gmail" from the list of accounts and you're disappointed to find out that you can only sync your mail, calendar and notes, not to mention that there's no push support. What about your contacts? A better option is to add a new account that uses Microsoft Exchange to sync. You can also manually add a CardDav account using these instructions, assuming that your device uses iOS 5 or iOS 6. If you need push support, the only option is to use Exchange. "By supporting IMAP, CalDAV, and CardDAV together, we're making it possible for 3rd parties to build a seamless Google Account sync experience," says Google. There are many applications and services that support CardDav: Apple's Address Book from Mac OS X, Atmail, CardDAV-Sync for Android, Apple's iOS. In my testing, Google Contacts via CardDAV does not automatically sync in the background like Exchange-based Google Sync does; it only syncs when viewing the Contacts list. As such, if a contact's phone number is added in the web interface, and that contact calls before the Contacts list is manually opened on the phone, just the phone number will be shown. this is a deal breaker for me if this is the case! CardDAV will "Fetch" updates on the schedule you select in the Settings. I have mine set to every 15 minutes. This is also the way IMAP & CalDAV work. And why no group synching still? It's so very basic, so very necessary to business, and last decade's news on most email systems, yet Gmail to iOS still doesn't support it. I am guessing the restrictions are enforced by Apple. I love syncing of data from Google+ on my Android phone. Hello my friend and why no group synching still,from INDONESIA with smile. 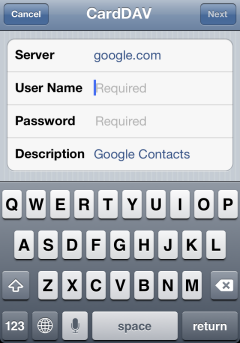 Google Contacts through CardDAV finally allow fullscreen contact picture! That's was a missing feature from Exchange sync. Wait I must be missing something here. On my Android phone and tablet I just put in my gmail address and password. Then all my calendar, contacts, and email sync continuously in the backround. There is no exchange Server Settings I need to mess with or any app that I need to install. Are you saying that all iPhones and iPads don't work that way? Gmail contacts syncronization is not built in? If that's the case, then yikes. @Jason Yep iPhone users have to set up through the exchange "active sync" feature but once that is done its fine. There is no system that works as well with Google services as an Android phone though. The content on your website never confuses me. We are also known for delivering premium services and hence our certified technicians ensure that the issues over installation & upgrade of Gmail online software suite get resolved at the earliest. Irrespective of the version of Gmail software suite installed in your computer, just get in touch with We247Help to avail help and support for Gmail any time any day and experience the most effective technical support for Gmail. Yes, CardDAV sync works for a while, until it decides to resync back with all the problems of the old Exchange system - no custom fields and tiny thumbnail images. I agree with Mike. Contact pictures get tiny thumbnail images, still. That was the only reason I have switched to CardDav instead of Exchange. Is CardDav going to be supported natively on future versions of Android ?